Alice Algae and Freddie Fungus took a lichen to each other. Yes boys and girls it's time to learn about the wonderful world of lichens. Join me as we explore the amazing symbiotic relationship of algae and fungus. Some lichens glow in the dark- especially handy if you hike at night. Did you know you could dye fabrics with lichens? And that the regal, rare purple dye was made from lichens after people over-fished marine mollusks? 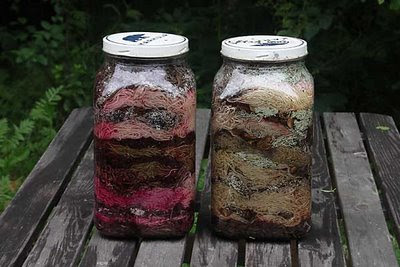 So here's a guy talking about experimenting with extracting dye from lichen. I found these passages to be interesting and enlightening. "Lichen dyeing has a long history, and by long I mean it was first mentioned in the Bible (Ezekiel 27:7). The process generally consisted of obtaining the desired lichen, adding it to stale urine and slaked lime, and waiting (Perkins, 1986)..." He goes on to say, "Like most lichens, Parmelia sulcata does not contain orchil precursors, but this species is said to yield a clear yellow dye." Um, I think you ended up with a clear yellow dye because you pissed into the mixture. All that work. Did you know that you can date how long ago a rock wall was built by measuring the radius of the lichen? They grow radially about 0.4—0.5 mm per year. Awesome. Here's a cool blog from a woman who dyes wool all sorts of natural ways. That looks so beautiful. I want to try. 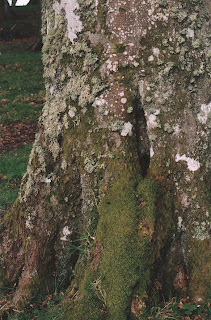 Lichens are also an indicator of air quality- a tree with lots of lichen growing on it indicates healthy air.